Philly.com – If you spot this guy – and let’s be honest, it’d be pretty hard not to – you should probably call police. According to cops, the man with the glamour (mug) shot is Maurice Jones, 26, who frequents 12th Street near Wagner Avenue and Sharswood Street near 19th. Police are looking for Jones in connection with the fatal shooting of Charles Tresse on Saturday. Tresse, 35, was shot several times in the chest on 20th Street near Montgomery Avenue around 10:45 p.m. and died shortly thereafter. Police believe the motive was an argument. Aside from the unusual, um, stuff around his face, Jones should be easy to spot because he’s 6-feet-4 and 240 pounds, according to police. Police don’t know the nature of the growths on Jones’ face and neck. “I don’t’ know why he looks like that. I’m trying to figure that out myself,” said one source. The city is offering a $20,000 reward for the arrest and conviction of Jones. 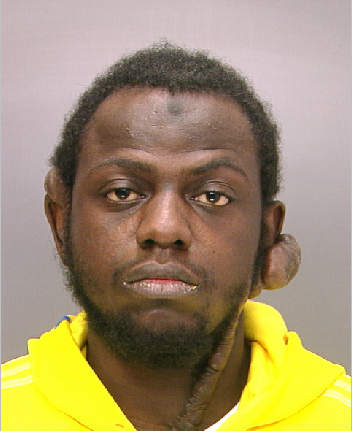 If you have any information on his whereabouts, please call police at 215.686.3334/35 or 911. I’m so simultaneously entertained and grossed out by this all at once. “If you have any info… call 911.” Thanks. The city is offering $20k as a reward for finding this cat, huh? And “police don’t know the nature of the growths on Jones’ face and neck.” Welp, in addition to the $20k, I got an extra $5 if somebody can explain to me what in the HELL is going on with his neck/ears. Looks like a tremor crawled into his right ear, tried to escape out of his left ear… couldn’t, so it started burrowing it’s way down to his heart. Yeah, I said it… TREMORS! 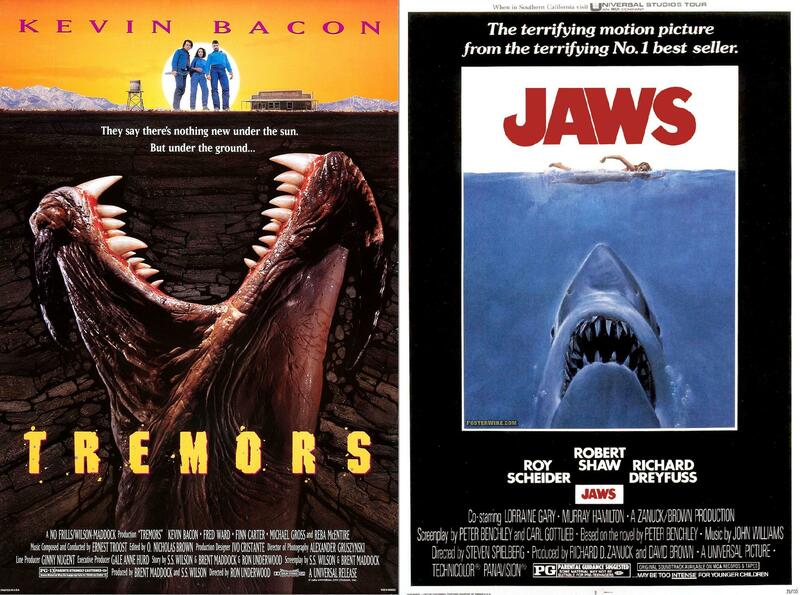 Total aside: Never realized the Tremors movie poster was an obvious rip-off from JAWS. This entry was posted in Movies, mugshots and tagged jaws, maurice jones, mugshots, tremors. Bookmark the permalink.